The Kemper WE8B Combo Wire and Wood Tool has a wire that is 0.055" in diameter on one end and the wood on the other side is a shaping tool. 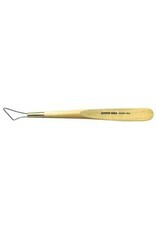 Kemper Combo Wire and Wood tools can be used for delicate tasks like removing or shaping clay. They are made with plated high-strength music wire attached with brass ferrules. This tool measures approximately 8” in length.